It’s that time of year again! 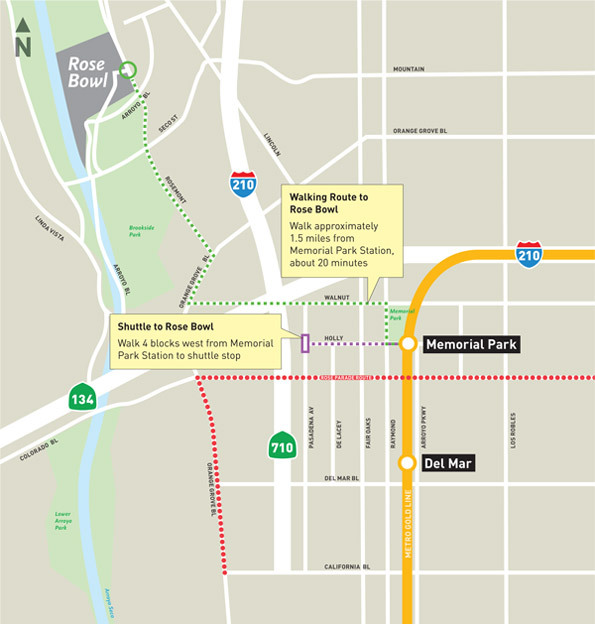 Here’s everything you need to know about how to Go Metro to the Tournament of Roses Parade and the Rose Bowl Game on Jan. 1, 2018. Float decorating in full swing. Photo via Rose Parade Instagram. Street and paid parking is limited near the parade route and traffic is usually extremely congested after the parade — just when people start arriving for the game. 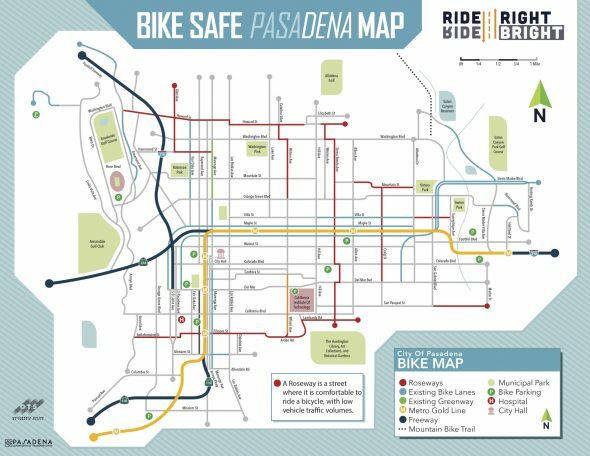 Take it from a Pasadena resident: if you drive, expect it to take up to an hour or more to escape Pasadena. But you can bypass all of that by taking the Metro Gold Line. The rest of Metro Rail will also run enhanced service on Jan. 1 through 9 p.m. Due to the large crowds expected to come out for the Rose Parade, large items such as umbrellas, chairs and coolers will NOT be permitted on the trains that day. There is parking available at many Metro Rail stations, including Gold Line stations. Some lots are paid, some are free, be sure to check here before you head out. It’s eight dollars a day to park at Los Angeles Union Station. There are also many paid parking in lots in downtown Los Angeles that are near the Red/Purple Line subway that can be used to connect with the Gold Line at Union Station. Take the Metro Gold Line to Memorial Park Station in Pasadena; then it’s just a short walk to Parsons Parking Lot B for the free shuttle that drops you off next to the stadium. Rose Bowl shuttle service begins at 10 a.m. on Jan. 1 and runs until 90 minutes after the game. If you are riding a Metro bus after the game, please check the individual timetables for last bus times leaving Pasadena as buses will be operating on a Sunday/Holiday schedule. Game day parking at the Rose Bowl or the Parson’s lot costs $40. 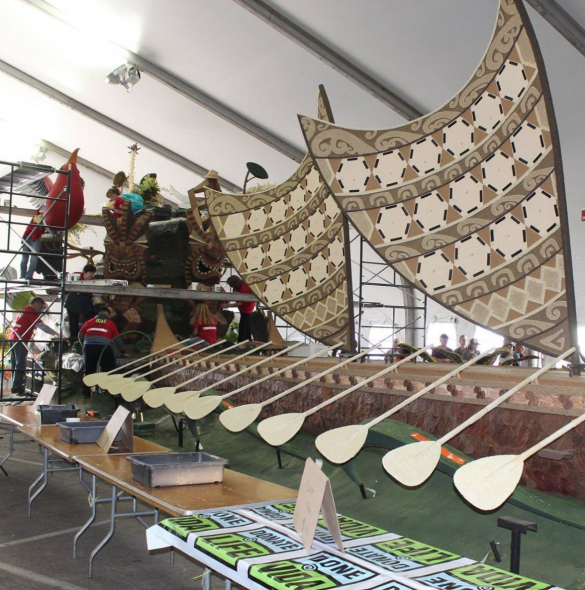 After the parade, floats are displayed near Victory Park in Pasadena. To view the floats, take the Gold Line to the Sierra Madre Villa Station. Go the first level of the adjacent Gold Line parking garage to board a shuttle to the float viewing area. On Jan. 1, shuttle service to the Post Parade area runs from 12:30 p.m. to 3:30 p.m. Return service to Sierra Madre Villa Station will continue until 5:30 p.m. On Jan. 2, shuttle service from the station to Post Parade Park will begin at 6:30 a.m. and end at 3:30 p.m. Service from the float viewing area to Sierra Madre Villa Station will continue until 5:30 p.m.
New this year: you will be able to ride Metro Bike Share to Victory Park. Metro Bike Share will have a mobile kiosk at Victory Park to allow bike share users with a Metro Bike pass to dock their bikes. You can purchase a Metro Bike Share 1-Day Pass with a credit/debit card for $7 here. With the Day Pass, all trips taken that day that are 30 minutes or less are free. Show your TAP card at the bike share booth and receive a free commemorative 2018 Rose Parade pin. Some of the bike share stations near Colorado Blvd. will be relocated due to the parade, be sure to check here for the updated station map. Load your TAP card with $3.50 round-trip fare in stored value when starting your trip to avoid long lines at TAP vending machines after the event. A Day Pass is $7. TAP cards cannot be shared; each person must have their own TAP card. Two children four and under can ride free with each paying adult. More fare information can be found here. 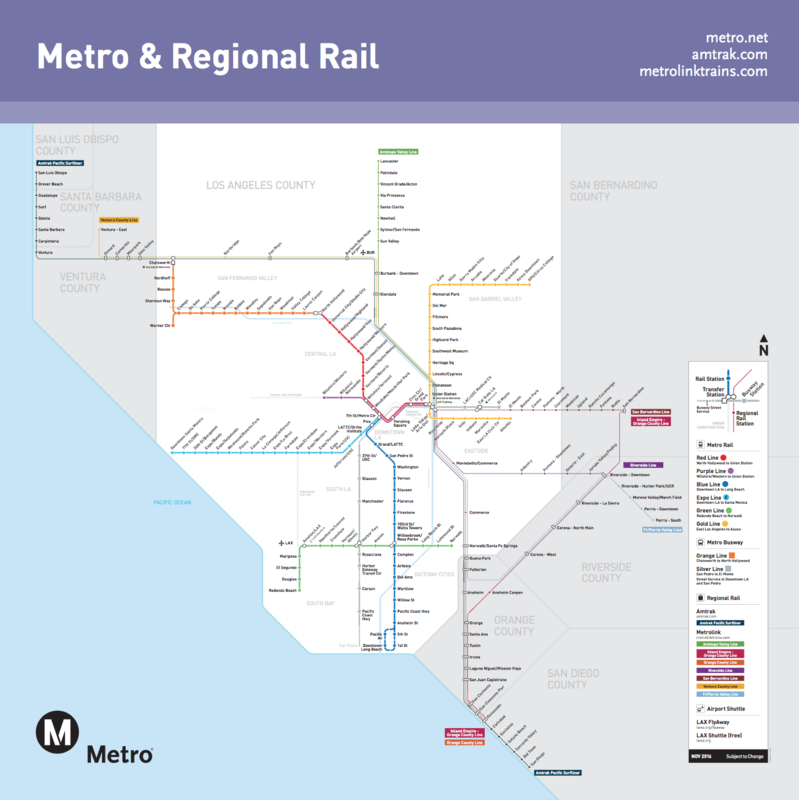 Below is the Metro and Metrolink map for our area. Metro runs the area light rail, subway and bus system that criss-crosses Los Angeles County. Metrolink runs commuter rail that serves the five-county area in addition to one station in northern San Diego County (Oceanside). The best way to take Metrolink to Pasadena is to take the Antelope Valley Line or San Bernardino Line to Union Station, then transfer to the Gold Line. Click here for more Metrolink service information. Is the post parade viewing shuttle free? Do Senior rates apply? Would this be considered on peak or off peak? Off peak! Because it’s a federal holiday. When are we going to get info on bus detours? Hopefully later today or tomorrow. We’re waiting to ensure the info is correct. Can you let us know more about the service on the 501 that day? I think it stops and Holly/Raymond for the parade, but I need to get to the south side of Colorado, can I still do that on foot? Hi Angela — Buses will not be crossing the parade route, but you can get across the route on foot before and after the parade. It’s tricky once the actual parade hits an intersection. To avoid the trickiness, transfer to the Goldline Memorial park station and go one stop south and get off at Del Mar. That would be the easiest and headache proof to get to the opposite side of Colorado. Is that still an option? Looking at this same article from last year, it says that the 501 will terminate at Holly and Raymond. There wasn’t a note about it this year so I was curious. Thank you! Also, does anyone know if strollers are counted as a large item? My coworker wants to take the Gold Line and has a baby. While the 501 will be running, it will not be running enhanced service which means buses will arrive every 45 minutes. There is an open space on board each train car for strollers, bicycles and large items. Just got what you meant, great idea! Is there mass transit from Palmdale CA to Rose Parade? I live off colorado directly on the parades path and i take the 258 South boarding from lake/green to Fremont/commonwealth. What do i do? The postings of alternative stops are very confusing! I’m coming from Burbank and I’m taking the hotel shuttle. Where is the drop off location?